Benjamin Gross, Director of Educational Technology at the Hebrew Academy of the Five Towns and Rockaway (HAFTR), has re-envisioned technology integration at HAFTR to bring the community closer together. He has thoughtfully introduced a variety of technologies that enhance the Jewish learning experience, the collaboration between student and teacher, and the body of work that students build in their portfolios during their time at HAFTR. This cutting-edge program includes computer programing, 3D printing, blogging, iPads, engineering, video editing, film production and many other exciting programs breaking new ground. For instance, Benjamin has implemented 3D printing in student projects to recreate symbols of Jewish history like the First Temple, melding ancient wisdom and modern technology. Benjamin works with all the teachers throughout HAFTR to help them actively use technology for flipped learning in their classrooms. He has brought outside resources to further advance his efforts, collaborating with The Frisch School and Solomon Schechter of Westchester to create a MAKER community for students and faculty. The curriculum adds value in teaching children a broad range of skills – from physics to engineering and design. Additionally, he is currently a PhD candidate in Educational Policy and Leadership at Hofstra University. Benjamin is using educational technology to create a deeper school community and to bring Jewish studies to life for kids and families. Rinat Levy-Cohen is transforming teaching methods for young Hebrew language learners through her creation of Ivrit with Ivry, a blended curriculum for learning Hebrew as a second language. Rinat became inspired to create the program after teaching Hebrew to Ethiopian immigrants during her Israeli National Service. She applies her inventive Hebrew language teaching methods at the Heschel Middle School and has presented her methods and research at various conferences. Her curriculum employs animated videos, e-books, games, tests and worksheets and provides educators with teaching methods to promote creativity and challenge learning. Rinat works closely with children who have learning difficulties, especially in language acquisition. She implements technology to address some of these language acquisition challenges. For instance, Rinat created an animated video project in which students created digital books in Hebrew for a group of students with speech deficits. The digital books increased her students’ reading accuracy and fluency and most importantly, their confidence in themselves. She aims to pass the torch of Hebrew literacy in an authentic and innovative format while also addressing language acquisition challenges. Through her efforts, Rinat hopes that parents and children will be able to share in the discovery of their heritage and language. Noah Hichenberg is Director of the Saul and Carole Zabar Nursery School at JCC Manhattan, a Reggio-inspired school oriented around Jewish values. The Reggio Emilia philosophy, based off a town in Italy, is centered on a child’s natural inclination to explore and discover, allowing children to construct their own learning in an open environment. Noah believes in play-based, progressive environments in which children construct knowledge through social interactions. In his role as Nursery Director, Noah has emphasized peer-to-peer professional development models for teachers and has supported an inclusive school environment for children with special needs. He is currently a doctoral candidate in early childhood education at Teachers College. Noah has worked to spread the Reggio Emilia philosophy to other schools throughout New York and has cultivated leadership in the field. In only his second year as Director, he has helped plan and facilitate workshops at the 2014 92nd Street Y Wonderplay Conference and has been instrumental in helping to bring the Reggio Emilia Wonder of Learning Exhibit to New York City. Noah remains on the pulse of important issues in early childhood education, such as Mayor DeBlasio’s implementation of a universal pre-k program which grants schools a four-year contract to provide day care. Noah immediately convened New York early childhood directors and representatives from the NY Department of Education to ensure that Jewish early childhood education can continue progressive practices while adhering to the city’s requirements. Noah’s contributions reach beyond the classroom, shaping and influencing the larger field of early childhood in New York. As Director of Youth Engagement at the Community Synagogue in Port Washington, Lindsay Ganci has changed the culture of youth programming at her congregation and created a sustainable model for teen engagement that is a gold standard for the field. 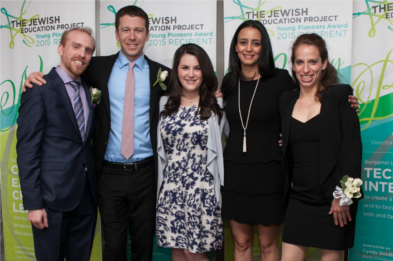 She has worked to enhance and enrich youth engagement before, during and after B'nei Mitzvah. She developed the synagogue’s youth group, POWTY, which serves three age groups: pre-teens in 4th – 6th grade, older teens in 8th – 12th grade and 7th graders, catering to their unique needs alongside their B'nei Mitzvah commitments. She also teaches some of the older teens about philanthropy and facilitates their grant giving through her teen philanthropy program in partnership with the Jewish Teen Funders Network. Lindsay is deeply entrenched in her synagogue community, teaching social action in the religious school and involving herself in FLAME, the family learning team. Her strong connection to the teens and synagogue community is evidenced by an increase in post-B'neiMitzvah attendance at Shabbat service and her former students regularly visiting from college to attend her POWTY programs. Social media and technology play a central role in her programming to further promote engagement in these teen communities and to promotePOWTY events. She continues to develop programming at the Community Synagogue by reaching out to other networks, most recently participating in The Jewish Education Project Operation Gamechanger initiative, which aims to empower teens in their Jewish education past the age of B'nei Mitzvah. Lindsay engages teens both through her personal relationships and by setting up sustainable structures and programs that can be replicated by others in the community and field. Maya Blank, educator and special education consultant at the Stephen Wise Free Synagogue, has spearheaded the creation of a religious school learning program, Kulanu, for children with Autism across the spectrum, many of whom have formerly felt excluded from religious school education. Her interactive lessons combine different modules of artistic expressions including music, technology, community service and environmentally friendly projects. She encourages parents to participate alongside their children, creating a safe learning environment for them in the Jewish community. Maya’s work to create an inclusive culture at Stephen Wise Free Synagogue has resulted in children from mainstream classrooms participating in Kulanu programs and in the entire community understanding the need for welcoming different learners into their classrooms, communities and lives. Under Maya’s leadership, children with special needs are able to fully explore their Jewish identity and feel part of the larger Jewish community. Her passion and hard work has made the Kulanu program and the Stephen Wise Free Synagogue known as an organization dedicated to inclusion and Jewish education for a population of children often marginalized.